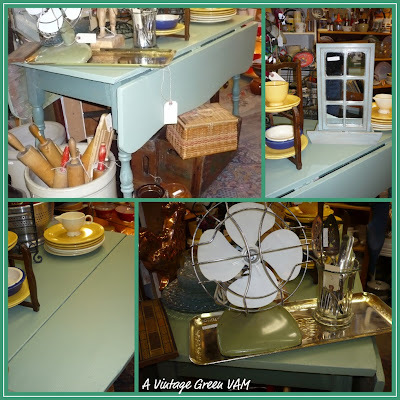 I continue to learn more about painting furniture as I read favorite blogs, especially Miss Mustard Seed. The wooden table below has had a long life and the underside was rebuilt many years ago by my Dad. This year more repairs were done by my DH. I painted the tabletop with green latex (oops paint) - 5 coats (should have started with Kiltz) and finished with 3 coats of wax over several days. Then I kept it in my kitchen for two weeks and used it to see if the wax would do its job. Since it did it went into my booth. Vintage, the real thing. The fan was a weekend find as was the small 'window mirror' which got a dry brush paint (pale green) and dark wax. I have a "love thang" with tables, so naturally I LOVE that drop leaf table. Someone is gonna love to give it a new home. You did a nice job on the table. Enjoyed seeing all your other goodies. Really nice table! I have a question about wax. I painted a storage cabinet we have in our bathroom, and distressed it and then gave it coats of wax to finish it rather than varnish. It was lovely to start but with dust, etc its starting to look dirty. When I try to clean it, the wax/finish scrapes off. How do you clean these pieces? Believe it or not, I'm just getting the oomph to paint furniture. I stripped so much of it in years past that I have been a painting chicken. I love the look of it. Yours is great.